Here’s an example of a discussion that has started about hijab in Holland. 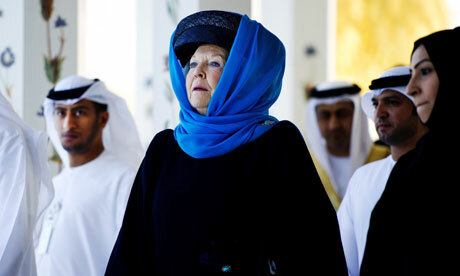 The Dutch Queen, Queen Beatrix of the Netherlands, wore a headscarf when visiting the U.A.E. out of ”religious respect”. Party for Freedom-leader Geert Wilders stated he thinks that the Queen gives off a wrong signal by doing so. He fears that by doing so, she ultimatedly legitimises other forms of hijab like burqa and niqab. Against all odds, the Queen reacted to him immediately, stating his fears were ”nonsense”. The Queen only very rarely gives her opinion about political matters in public, so this was a very rare quote indeed. Read the news article by the Guardian here. Last year, the Queen stated in her annual Christmasspeech that the society should be focussed on brotherhood and similarities rather then on differences between people. Geert Wilders, leader of the Freedom Party then posted a scornful tweet wondering if the Queen had become a member of the left-wing Green Party, one of his main political opponents. – Diversity – Women Clothing #4 – Check this out! I love the series you’re doing on women and clothing. There is so much confusion surrounding the hijab and related aspects. Thank you for bringing more clarity to the subject!